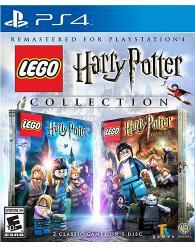 The 'LEGO Harry Potter Collection' bundles two previously released video games, namely 'Harry Potter: Years 1-4' (2010) and 'Harry Potter: Years 5-7' (2011) that were released on all major platforms of the time (a promised PlayStation 2 port was canned, however). The re-release for the PS4 promises updated graphics and other minor alterations. So in 2016, will a first time player find the games to be excellent wizarding wonders, or mere muggle musings? First things first: this is yet another LEGO game. Gameplay-wise, they are terribly similar. If you hated the previous entries in the franchise with the passion of a fiery fantastic beast whose whereabouts are familiar to you, please don't expect this game to be different. This is strictly for LEGO game fans, and die-hard Potterheads who want every piece of merchandise for their collection. Yours truly thoroughly enjoyed 'The LEGO Movie Videogame', 'LEGO City Stories Undercover' and 'Lego Jurassic World', but I haven't played any of the other titles in the long-running series. At the time of writing, I am not yet fed up with them. In fact, I would give an arm and a leg for a full 'LEGO Back to the Future' or 'LEGO The Goonies' game. Yes, I know both franchises have been released or announced for 'LEGO Dimensions', but I have not yet acquired that wallet-crippling game. Someday, Jennifer, someday. Directly comparing 'LEGO Harry Potter Collection' to any other TT LEGO game reveals no huge surprises or groundbreaking innovations. The standard LEGO videogame rules and tropes apply: collect studs for extra collectibles, destroy the scenery, rebuild the scenery, interact with and switch between other characters, play co-op with a significant other or a friend, unlock a whole lot of goodies, replay levels for added interactivity, laugh at the visual jokes or cringe at the sometimes questionable attempt at comedy, etc. It's more of the same. At the start-up of this remastered PS4 collection, a splash screen appears giving me the choice between 'LEGO Harry Potter: Years 1-4' and 'LEGO Harry Potter: Years 5-7'. Apparent, obviously true by simple observation, and evident. Or so I thought. Turns out 'Years 5-7' is locked until I have played a few 'Years 1-4' levels. Hm. Color me confused. If this is supposed to offer me both games in one handy collection, how and why is it I can't select the second game from the get-go? Say I had bought both games separately, I would have had said choice. What if I'm a Harry Potter fan that only likes years 5-7, and I have no intention of ever playing years 1-4? Weird, TT Games, very weird. After clearing just 5% of 'Years 1-4', 'Years 5-7' did become available for play. What's going on here? The games offer a slew of random funny moments that beg to be discovered. Fluffy, the dog with three heads, can be distracted by a huge inflatable rubber duck that one can use while bathing. Subsequently, a harp plays 'Rock-A-Bye Baby' and Fluffy dozes off. A meta-example of humor sees characters walking around with LEGO keychains, which means LEGO characters are aware of their minifigure status and collectability. Think about that for a second. An unrelated occurrence that delighted me, was the appearance of a LEGO wheelchair. Quite surprising, because LEGO (the brand) has only just released its first disabled character in set 60134 earlier this year. TT Games were effectively ahead of their time. Kudos to them! There are loads of spells, characters, and alternative costumes to unlock. True to LEGO game form, there is not enough time in a day to truly finish the game. Be prepared to spend upwards of 100+ hours to see everything, turn every brick, catch every stud and fly every broom. Any negatives? At times, solving a minor puzzle rewards you with a small cut scene. Reviving hearts and studs will appear, but these can disappear by the time the short cut scene comes to an end. That's just annoying. There's a pumpkin that can be used as a bouncing ball with the most excruciating sound, and when jumped off, said sound gets looped infinitely (or, until pressing pause and returning to the game). Small design niggles, though, and not nearly enough to put the game down. Having never played the 2010/2011 versions of the games, I can't tell you the differences in this revamp. I did some research, and apparently, there's no added value. In fact, some old glitches were never repaired, and new ones were added. I never encountered game-breaking bugs, luckily. The 'LEGO Harry Potter Collection' is funny, well-made, innocent and rewarding. It's about time TT Games shook up its formula and delivered a true gamechanger of a game, but it'll do for now. Solid fun for those who missed the games the first time around. Just like all LEGO games, the graphics and visual effects in 'LEGO Harry Potter Collection' are pixel-perfect plastic renderings. Which means the game constantly reminds you you're playing with virtual LEGO bricks, without the associated injuries (I can't wait for the inevitable LEGO virtual reality game where the pain of stepping on a brick will be recreated in perfect foot-lambasting pain). This isn't a game that embraces the raw processing power of the PlayStation 4. It's never presented as a demo game to showcase the system, and it was never intended to be one. I'm betting the PS3 can pull this one off in its stand-by modus. In 'LEGO Jurassic World', the voices were ripped straight from the movies, and it made the whole experience extra awesome. In 'LEGO Harry Potter Collection', however, characters speak in grunts, shouts and whispers. Simlish, but not quite. I know this is true to the original games, but ever since 'Lego Batman 2: DC Superheroes', LEGO games have featured full voice acting. Is it too much to ask a remastered collection to address this? As it stands, the specifics of this mute 'LEGO Harry Potter Collection' are unclear, but it soon grows tiresome. Sound effects are spot-on, though, and the orchestral soundtrack is just as epic as the movie counterpart, if a tad repetitive. Better buy a razor, because you will have a beard that can rival Dumbledore's by the time you have finally attained a perfect 100% rating.